Some new English and Western saddles cost hundreds if not thousands of dollars. Therefore, you may save some money by finding a "bargain" old saddle at an estate sale or auction and cleaning and restoring it if you have the equipment and skills. Be prepared to spend a lot of time properly cleaning your old saddle and making the necessary repairs so you can restore it to its former glory and use it for riding. Loosen all parts. 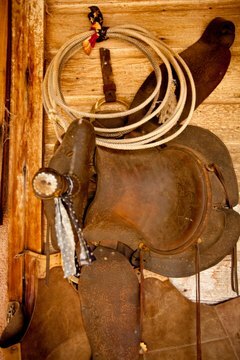 In order to thoroughly clean the saddle, remove the stirrups and girth and remove or at least loosen the conchos (see Resources). If you can, loosen the back jockey (back of the seat) and the side jockey (saddle sides) if you can. You will need to remove some nails very carefully with the screwdriver and nippers. Be careful not to tear the leather. Wash the saddle. Place the saddle on the sawhorse for drainage and support purposes. Thoroughly wet the saddle with the garden hose and scrub with Ivory soap and a soft brush. Rinse immediately and allow to dry. Wash again with saddle soap, using a toothbrush to thoroughly clean the tooling and hard-to-reach crevices. Restore the leather. To restore the leather to full pliability and shine, thoroughly wash it two or three more times over the course of a week with saddle soap. If you want to waterproof your saddle, apply a thin layer of mink oil after the final saddle soap washing. Replace broken parts. You can buy new stirrups, girths and straps at any farm and ranch supply store. You can get replacement buckles from your local saddle repair shop or from an old saddle you keep for spare parts. If you haven't already, use the screwdriver and nippers to remove all tacks and grommets holding a broken girth strap or broken buckle to your saddle, and replace with your new strap or buckles. Use new grommets or tacks to hold them in place. New stirrups can simply be buckled into place at the correct length. Reassemble your saddle with the screwdriver and nippers. Don't forget to tighten or reattach the back jockey, side jockey and conchos once your saddle is cleaned and repaired. If you do not have moderate leather-working skills and the proper leather-working tools, have a professional repair your old saddle. Do not let the Ivory soap sit on your saddle for too long; rinse as soon as possible. Never use petroleum-based oil product on your saddle. It will encourage mold growth.